Nuclear Armageddon is in the air along with spring, and if the events in Japan weren’t so dire they might spike opportunities for book and movie tie-ins. The primary candidates would be John Hersey’s Hiroshima and Neville Shute’s On the Beach , along with the box-set of the entire Twilight Zone television series. Books about Chernobyl and Three Mile Island are more to the point, but there were none that reached the iconographic levels of the three aforementioned cultural artifacts. The fifties were the heyday for the imagination of nuclear holocaust. The U.S. was testing H bombs on supposedly deserted Pacific atolls like Bikini that were immortalized in the folk song "Old Man Atom" (“Hiroshima, Nagasaki, Alamogordo, Bikini”). 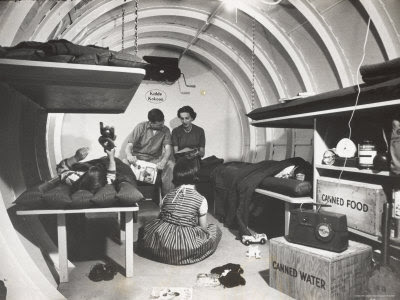 The stockpiling of canned and dehydrated foods along with the concomitant conventions of fallout shelter design were beginning to emerge. Remember the yellow and black signs for fallout shelters, which were one of the first things you saw when you walked into a public school or other municipal or federal building? If only the aftermath of the Cuban missile crisis and the realization of how close we’d come to a conflagration hadn’t spurred the first test ban treaties, which at one point had only been twinkles in cold warriors’ eyes! By the sixties and seventies America had fully entered the Viet Nam war, but it was a curious divagation. Protest movements shifted their concern from nuclear energy to American imperialism and our penchant for protecting democracy by supporting anti-democratic leaders like Diem and then Thieu in Viet Nam and Ferdinand Marcos in the Philippines. In fact, nuclear energy seemed like a clean and efficient way to deal with the West’s appetite for oil and its increasing dependence on OPEC. This VBS report on Chernobyl is really inspiring, esp the line "There is no fear of death. Everything is death" and the abandoned ferris wheel is The Third Man--mutant version that is.